This weekend begins at 2 pm on Friday and completes at 4 pm on Sunday, everybody is given a single room unless they request otherwise. Just an hour from London and nestled in 150 acres of parkland Henlow is an ideal country escape, and a perfect pampering retreat It blends the tradition of the old with the innovation of the new, offering luxury and grace combined with a cost atmosphere that makes every guest feel at home. Each of our guests has one Thalassotherapy session included in the cost of the weekend. A mineral rich warm pool with hydrotherapy jets to stimulate and tone tired aching muscles. Excellent for treating cellulite, arthritis and general muscular and joint aches and pains. N.B This is a group treatment. Nestling amongst the Andalucían Mountains we are within walking distance of the traditional Spanish white hamlet. Here your hosts, Richard and Betty, provide a quiet comfortable yoga retreat where you cannot help but relax. One of the many attractions of the centre is its breathtaking views. With mountains on three sides, the centre rests beside an open valley with a grand vista of both Lake Viñuela and the Mediterranean Sea. Perfect for walking, the local scenery is stunning. Sunbathing takes place by the oval, salt water, swimming pool, with its mosaic lining. Lay on the sun-beds with a book and look down through the olive groves to the lake below you and, far in the distance, glimpse the glittering sea, on a clear day you can see Africa. Kissamos, also known as Kastelli, is a small town which mostly sells tractors to the local farming community. There is however a network of cobbled streets where you can find shops and cafes leading to an area which overlooks the sea where there are traditional Cretan fish restaurants. Our yoga venue is on the very outskirts of the small town. Here the sea is clean, warm and shallow making for easy swimming with a long quiet strand of golden sandy beach with occasional shingle. Our beach is called Mavros Molos and the yoga space is above the beach looking out to sea. Kastelli is a seaside resort which attracts Greek tourists. Behind this coastal plain the backdrop is mountainous, the area being broken into gorges and craggy peaks. This provides for many easy grade walks, the chance to see birds of prey, vultures and wild flowers and old rural ways like treading grapes. This yoga hotel is charming. Dalyan village is situated on the small river that joins the lake to the sea. Our small yoga hotel is in the conservation area between the village and the beach. This is our new venue on the beautiful thermal island of Ischia. It is close to St' Angelo, a truly pretty unspoilt village also on the coast. Although we do not have a swimming pool we are only 5 minutes walk from the sandy beach which has crystal clear waters, sunbeds and a small beach cafe.. The venue will be for the exclusive use of the yoga group and will take a maximum of 14 participants in the yoga space. This is true Italy and we know you will enjoy it. It is close to St'Angelo with its narrow streets and lanes and high-fashion boutiques - you may either walk there or take the bus. The small lush garden at the rear is perfect for those seeking peace and tranquility, surrounded by green vineyards and citrus groves. 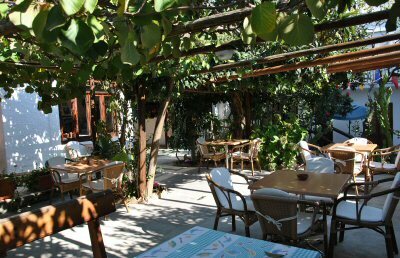 A peaceful garden with a bar-restaurant area, enfused with ancient perfume of flowers, with kiwi vines, lemon trees and cycads. Here we will also eat our meals. Oxon Hoath is easy to get to and only a short distance from London by train or car, making this an ideal weekend retreat. 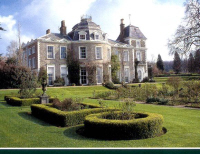 or of Oxon Hoath has 73 acres of its own beautiful, tranquil gardens and parkland and is a joy to explore. The exotic trees and romantic gardens, sweeping lawns and mysterious woodlands; hidden dells; secret gardens; courtyards and sculptured lake (perfect for sunbathing) create the perfect environment for self-discovery, profound learning and spiritual development. There are two yoga rooms at Oxon Hoath, Jean Hall will be teaching in one and Liz Lark in the other. You may choose which teacher you work with for each session. One will have beginner intermediate students and the other intermediate advanced students.